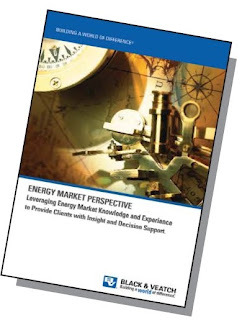 Black & Veatch, a 95 year old Energy Consulting Group, recently released their 4th annual Strategic Directions in the Electric Utility Industry Survey. To get the data, they surveyed 329 utility industry representatives from public (78 respondents) and investor-owned (147 respondents) utilities as well as 104 architects, builders, engineers, non-regulated generators, financial institutions, attorneys and others affiliated with the industry. I've included some of the findings of the report below, but it only scratches the surface of the full report that you can download free from their website: http://www.bv.com/energysurvey.- it's worth the read. Energy industry participants rate their top three concerns as reliability (old equipment and workforce), regulation (how will the carbon be regulated) and long-term investment (economic climate preventing rate increases). 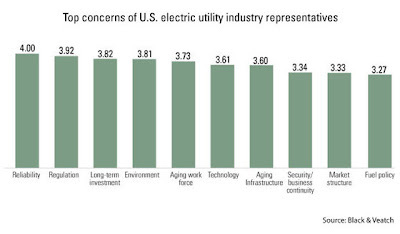 Many utilities rate their generation assets as near, at or passed planned service life. Survey respondents believe there remains a future for coal in U.S. power generation. Utilities perceive nuclear technology as the best technology for meeting environmental standards. Utilities expect nuclear power will play a larger role in the U.S. electricity mix by 2050. Utilities are investing in renewable energy with wind and solar leading the way. Carbon legislation and water supply are the most pressing environmental concerns for utilities. Most utilities believe that some type of carbon legislation will be approved at the national level by no later than 2012. Survey participants do not favor the cap-and-trade approach as specified in current legislation. If cap-and-trade legislation approved by the U.S. House in June 2009 is enacted, a plurality of survey respondents believe it will add between $500 and $1000 to the average homeowner’s annual energy expense by 2015. Consistent with trends in general public opinion (as reported by respected public opinion polls), the respondents seemed a bit more reserved this year than last on whether global warming is man-made, and if carbon legislation would be passed anytime soon. Fifty-two percent of the respondents believed that the country can ill afford carbon legislation, while only 28% felt otherwise. Just less than two thirds of our respondents expect cap and trade legislation to result in increases in annual residential electricity bills of over $500; 25% expect the impact to exceed $1,000. This is roughly consistent with recent Department of Energy projections. Thirty percent regarded generation as the asset class most in need of replacement. However, running a very close second place – at 28% - was information technology (IT), no doubt reflecting the priorities created by the Smart Grid and the need for improved cyber security. Computers and networks were regarded as the asset classes most at risk of harm by outside forces, such as acts of terrorism and cyber attack, up from last place in 2006, the first year of our survey. No doubt reflecting concerns about the security of assets, respondents expect the cost of complying with Critical Infrastructure Protection (CIP) security standards to increase significantly. Approximately 60% of the IOU and public power respondents expect cost increases of over 10%; over 30% of respondents expect increases greater than 20%. By contrast, in 2006 – the first year of our survey – only 34% were concerned about cost increases greater than 10%. Respondents believe that regulation is by far the strongest driver of new technology implementation. IOUs think government incentives – inspired no doubt by the federal stimulus program in the Smart Grid and renewable supply arenas - are the second most important driver, while public power systems see customer-focused initiatives as number two. Ironically, IOUs –which in many cases have open retail access – rank customer-focused initiatives as the fourth most important driver. Industry R&D ranks last for both IOUs and public power systems. DSM and Energy Efficiency programs continued to grow in size and scope. More than 50% of our respondents indicated they were spending 2% or more of gross revenues on such programs. This equates to IOU expenditures of between $5 billion to $6 billion annually - roughly 15% to 20% of before-tax-earnings. DSM and Energy Efficiency spending by public power entities is up as well. New expenditures for Smart Grid applications by both IOUs and public power systems would be in addition to this. Respondents expect load and revenue growth to recover as the Great Recession unwinds, but at rates below pre-recession levels. Renewables appear promising. We know that while still somewhat expensive, the costs of renewables are declining and beginning to close the gap with the costs of more traditional generation. However, the respondents identified two major challenges: (1) the cost of wholesale power and other competitive options relative to the present cost of renewable technology; and (2) interconnection and transmission capacity issues, including the management of intermittent power. As in 2008, ALL respondents ranked carbon emissions and water supply as the first and second top environmental concerns. This year, mercury replaced nitrogen oxides as number three. Respondents continue to believe that the industry should place its emphasis on nuclear power as the most environmentally friendly technology for the future. A large majority of respondents do not buy into the notion that the future of the industry is a highly dispersed generation model. They see, instead, an evolution towards a hybrid of central and dispersed electricity production systems by 2015.